For traditional Indian dress, a medieval reenactment or a Renaissance Faire, children's tunics are lovely and easy to buy or make. They can be unisex - and they can even be modern. Children wore a variation of a tunic for centuries - dating back to the Romans and Egyptians. The loose, wide-neck garment, easily belted, was worn by just about everyone. Simple versions were perfect for children - the tunics could be cut from adult clothes that were wearing out, and they were easily washed and worn. They did not restrict movement and could be layered with other garments for warmth as needed. While children stopped wearing tunics by the 18th century in the Western world, they remain a regular part of the wardrobe throughout the Middle East and Asia. The interest in historical reenactment continues to grow, thus creating a market for children's tunics. 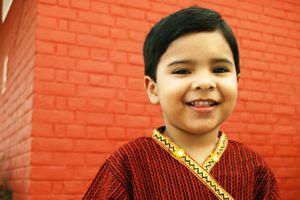 At Revival Clothing, you can get long or short tunics for children based on a medieval design. They are unisex, long-sleeved and have a notched V in the collar. You can get either plain or parti-colored tunics (each half in a different color), with a matching hood if you choose. For more elaborate tunics, perfect for theatre, go to By the Sword. You can get a tunic and surcoat set in custom fabric. The tunic has three-quarter sleeves, a keyhole neck and falls to mid-thigh. It comes in a solid color of your choice with contrasting trim. It also comes with a belt. Indian silks are some of the most beautiful in the world, and when a child is dressed in a traditional kurta tunic, they are especially beautiful. There are many online shops selling quality Indian clothes outside of India. You might start with Indian Clothing Mart, also called Premadaya. Their children's tunics are 100 percent silk. The color selection varies, but the basic style is a long-sleeved tunic with side slits, three buttons and embroidery around the placket and neck. You can get a much larger selection at Masala Baby, with categories for boys, girls and infants. Indigo Stripe: For daywear, this striped tunic with a closed placket is made of 100 percent cotton in a rich blue with chili pepper and cinnamon-color stripes. It must be washed in cold water and hang-dried. Peacock: A lightweight cotton tunic in teal with peacock feather embroidery on the shoulder and front hip. Evening Sun Stripe: A rich saffron striped tunic with solid bordering on the placket, cuffs and hem. White Peacock: The same as the blue, only this tunic is white, allowing the peacock feathers to pop more strikingly. Love Birds: A deceptively plain white tunic in a textured woven fabric, it features embroidered love birds sitting on a branch on the back. The same tunic is available in hot pink. The site also sells leggings and pants to match, so your child can have a full outfit. Finally, you should look at Desivastra, which is more traditionally Indian and offers casual and dressy kurtis as well as accessories and jewelry. Even if you are inexperienced with sewing, a tunic is such an easy item to make. Children's tunics are smaller and require no shaping, so you should definitely try to whip one up. You can find many patterns online - sometimes for free. Search sites dedicated to medieval and Renaissance reenactments. You can even draw your own pattern, since it is so basic. Just be sure to dummy it up in muslin first. It will be so comfortable and fun to wear, your child might want to wear it on any number of occasions!